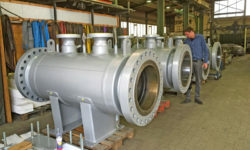 Thielmann Energietechnik GmbH in Kassel is an international acting company for more than 35 years for Engineering and Delivery of Pressure Vessels for ‘Gas Filtration and Gas Pre-Heating’. Highest technical demands from low-to-high pressure, low-to-high temperature applications and extraordinary design-codes are procured for your customized projects and specifications. 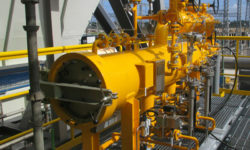 Our long-term expertise on the design for gas filter, dust/cartride filter, dust-liquid-separator, single cyclone and multi cylcone separator, heat exchanger, waterbath-heater, fuel gas performance heater, condensate tank, gas mixer, absorption silencer, pig launcher and customized pressure vessels make your systems complete. We can fullfil the requirements of AD 2000, EN 13445, EG/PED 2014/68/EU CE, ASME, U-Stamp, China-Stamp, NACE, DOSH, TEMA, SVTI, ERI, MOM, EAC/TR CU (früher GOST TR), AS1210, PD5500 (British Standard), Ö-Norm, Stoomwezen and more. 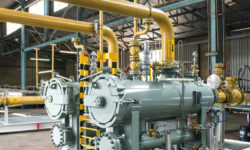 Custom Specific Solutions on Demand for your Gas Systems! For Standard Gas Systems up to 1000 Nm³/h we offer our DVGW-certified cellular gas filters in cast aluminum and cast iron. Various sizes are availble in stock. Lower your risks and make your projects safe and valuable with our products! We make your Gas clean! Our filters and separators clean your gas on a physical basis by means of mechanical separation methods of particle pollution such as dust, liquids and oil mist. With your custom-specific operating data, we determine the most efficient and reliable solution for you. Any combination of gravitational, centrifugal and filter cartridge systems are optimized for your application. 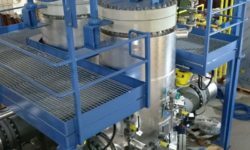 Any combination of gravitational, centrifugal and filter cartridge systems are optimized for your application. 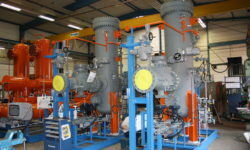 The use of heat exchangers increases the efficiency of your systems. 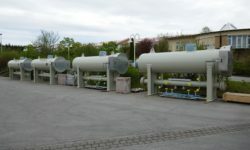 The pre-heating of the gas makes your system pressure-stable and the gas thus transportable. 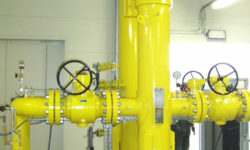 Most gas installations require compensation for the so-called ‘Joule-Thomson’ effect. With this effect, the gas temperature decreases with a constant flow rate through pressure reduction. 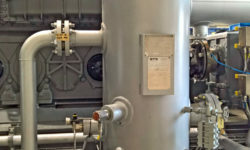 Thus, the gas cools down, for example by using pressure reduction systems, by external temperature fluctuations or by flow through long transport lines. If the gas is heated at selected system points pressure stability or gas temperatures are achieved which make a subsequent system component more efficient, e.g. for gas turbines.